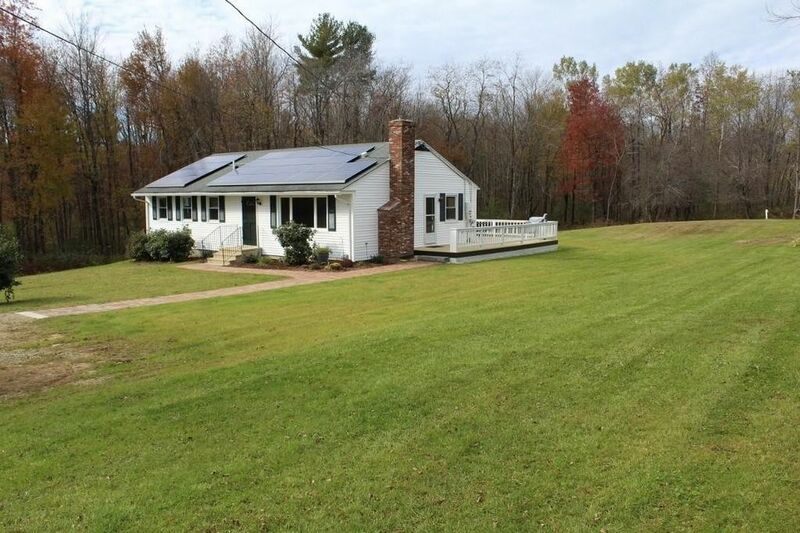 Very well kept 3 Bedroom Ranch on nicely landscaped 1.3 acre lot and located on dead-end lane just off of Rt 122 North of Barre Center. Updated over the years with replacement windows & patio door, fresh paint, custom cherry kitchen, attractive laminate flooring and fireplace with pellet insert. Spacious living room with southerly facing picture window for plenty of sunlight and the option of using the wood pellet fireplace insert for a cozy living space on cold nights. Nice size bedrooms with plenty of windows for natural lighting. Basement office/den/family room nicely finished with laminate floor and hard ceiling. Energy efficient with added insulation and air sealing. Huge wrap around deck with recently replaced decking overlooking the private side and back yards, perfect for enjoying cookouts and entertaining. Large lawn area around entire house with garden spaces and pretty paver/granite walkways leading to the house. Leased solar panels help with electric bills.